WASHINGTON — A majority of Americans support congressional action to continue the Deferred Action for Childhood Arrivals (DACA) program, but Republicans — and particularly President Donald Trump’s most loyal supporters — want to end it, according to the latest NBC News/Wall Street Journal poll. 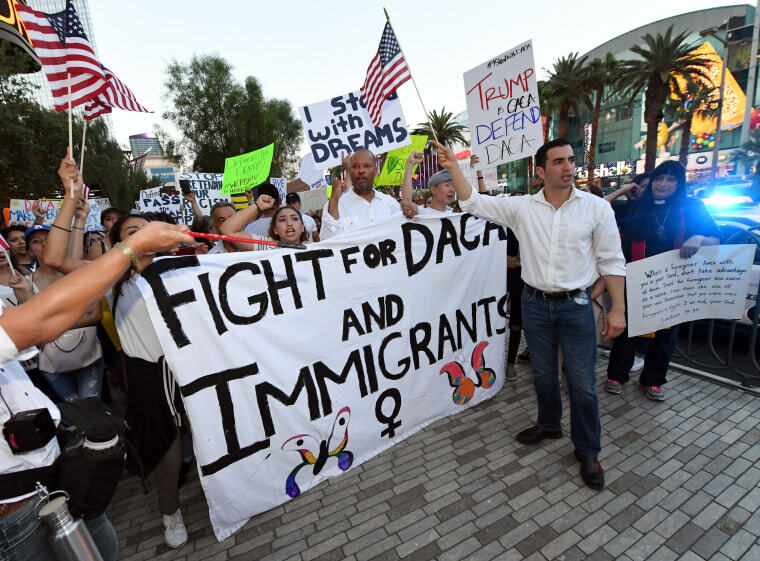 The survey, which was conducted after Trump announced a phasing out of the program unless Congress acts in six months, shows that 53 percent of all Americans want lawmakers to codify DACA, which allows many young people who were brought to the U.S. illegally as children to stay in the country. By contrast, about a quarter — 23 percent — say Congress should take no action so that the program ends. Among Republicans, however, a larger share want to see DACA nixed. Thirty-nine percent of Republicans say the program should be ditched, while 29 percent believe it should continue through congressional action. The difference is even starker when Republicans are sorted by their allegiance to the president and their party. Among Republicans who say that they consider themselves primarily supporters of the GOP rather than Trump, 32 percent want Congress to act on DACA, while 26 percent believe the program should end. But among those who say their primary allegiance is to Trump rather than the GOP, nearly half — 49 percent — say DACA should end. Half of independents (51 percent) and three-quarters of Democrats (76 percent) say Congress should vote to continue DACA. Trump himself has expressed sympathy for individuals enrolled in the program and urged Congress to "pass DACA." Last week, he tweeted: "Does anybody really want to throw out good, educated and accomplished young people who have jobs, some serving in the military? Really! … They have been in our country for many years through no fault of their own — brought in by parents at young age." About half of the poll’s respondents appear to share Trump’s positive opinion of the beneficiaries of DACA — known as Dreamers. Asked about their views of Dreamers, 51 percent of all Americans offered either a very positive (31 percent) or somewhat positive (20 percent) assessment, while just a combined 19 percent had either a somewhat negative (9 percent) or a very negative (10 percent) opinion of them. The poll also showed increasing support for the granting of automatic citizenship to all children born on U.S. soil — commonly referred to as "birthright citizenship." Overall, 65 percent of Americans say the U.S. should continue to grant automatic citizenship, while 30 percent disagree. In September 2015, only a slim majority — 53 percent — supported the continuation of birthright citizenship, while 42 percent supported a change to the policy. And in 2010, the public was equally divided, with 49 percent supporting the continuation of automatic citizenship and 46 percent opposing it. The NBC/WSJ poll was conducted Sept. 14-18 of 900 adults — nearly half reached by cell phone — and it has a margin of error of plus-minus 3.3 percentage points. Among the 741 registered voters who were interviewed, the margin of error is plus-minus 3.6 percentage points.